Hi Everyone, I’m Chris, mostly known as pearshapedchris after the name of my blog Pearshapedcrafting. I must tell you how honoured and excited I am to be here as a guest host once again! As Winter draws near (we are back to dark evenings here in the UK) I have chosen ‘101 Ways To Keep Warm’ as my theme. I have in mind cosy nights in, warm clothing, hot drinks, sheep and other woolly animals, exercise(if you must!!! ), candles, anything that gives you a warm glow (I think Hygge might be the term now)! In the UK it is very nearly Bonfire night which is on the 5th November and the song ‘Keep The Home Fires Burning ‘ always reminds me of Armistice Day on the 11th November. I hope that between us we can find 101 ways to keep us warm this Winter and I am looking forward to visiting your blogs to see your ideas! PLEASE remember to take a look at our rules. Your artwork must be larger than A6 (which is approximately 10x15cm or 4x6 inches) in order to be accepted. Die liebe Chris von Pearshapedcrafting ist diesen Monat unsere Hostess und ich freue mich riesig darüber sie wieder als Gastgeberin gewonnen zu haben. hat sie als unser Thema gewählt. Das passt perfekt in den November - ich bin gespannt ob wir wirklich 101 Arten oder gar noch mehr zeigen werden. Denke auch ein wenig außerhalb der Box bitte: Warme Getränke, warme Gedanken, Liebe, Sonne, Kerzenschein, kuschelige Freunde und Haustiere zum Kuscheln, wärmende Kleidung, Sport... die Möglichkeiten für's Art Journal sind wieder sehr vielseitig! Viel Spaß und bitte beachte unsere Regeln . Dein Werk muss größer sein als A6 (das ist ca. 10 x15cm ), um akzeptiert zu werden. I wish you a lot of fun this month! Thank you so much Elke - it's difficult to follow such a good host! Great new theme Chris, and I love your cosy collage! What an unusual theme, nice idea, Chris. another really lovely theme Chris!! 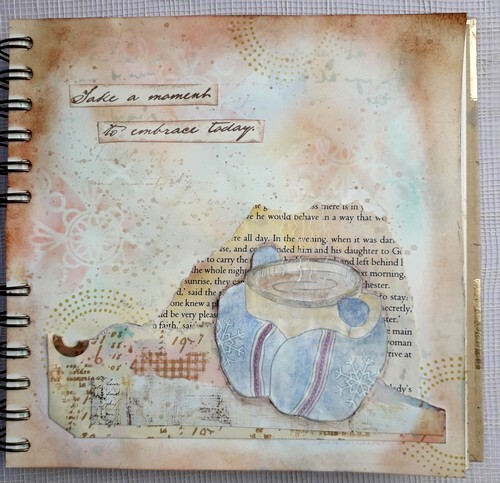 Beautiful, warming journal page. I'm looking forward to keeping warm with you all! Da würde ich doch sooooo gerne mein Teebeutel Artjournal posten. Ist aber leider zu klein. Wünsche dennoch Allen kreatives schaffen! Its a wonderful new theme Chris and your page is inspirational. What a great warm and cozy page Chris and such a great idea for the theme. That´s a so wonderful page Chris !! I Like very much the beautiful background you have created, the layers and the colours. I love the torn text and the soft colors. Another great prompt!